Fish Report - Big Bluefin! 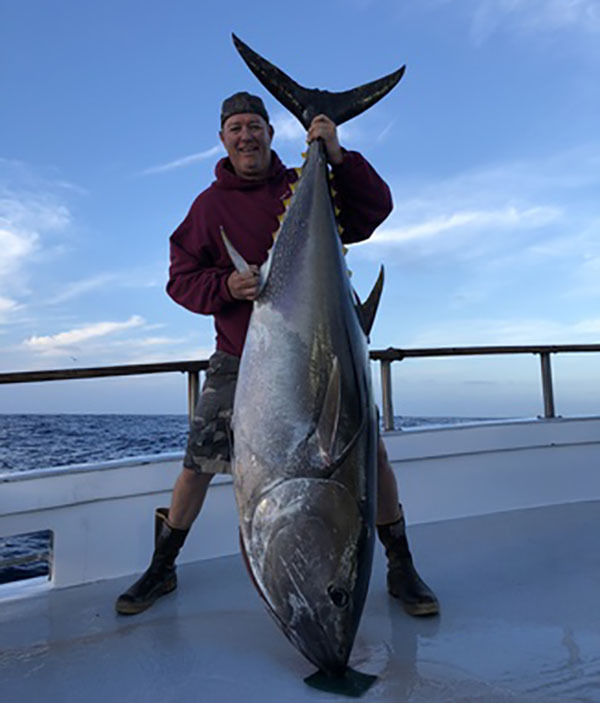 UPDATE 2:45pm - Captain Greg on the Aztec just called in with 8 Bluefin Tuna (190lbs - 291lbs) with 4 fish still hanging! Greg says the majority of their fish have been caught on fly-lined baits on heavy tackle up to 130# line and 3/0 and 4/0 sized hooks! The Tomahawk has a two day trip leaving Friday night at 7:00pm targeting Bluefin Tuna! There are only a few spots left! The Tribute has a 1.5 day trip leaving Friday night at 7:00pm also targeting Bluefin Tuna which is a DEFINITE RUN! Call now to make your reservations! The Tribute returned this morning from a 1.5 day trip with 6 Bluefin Tuna (215lbs - 248lbs)!